AXION are the market leading inflatable event tent choice for those who wish to draw attention! We provide an impactful and safe outdoor space without any compromises. This modern and slim inflatable dome – a pneumatic structure made of strong polyester skin and sealed polyurethane bladders – provides excellent stability and safety even in extreme weather conditions. Since it is sealed, there is no need for a permanent electric connection. Simply inflate it by hand or electric pump. The whole tent surface is fully printable using dye sublimation technology. Even the largest tent in our product line will fit in your car and can be set up quickly with only 1-2 people. Make your event more attractive – go AXION! 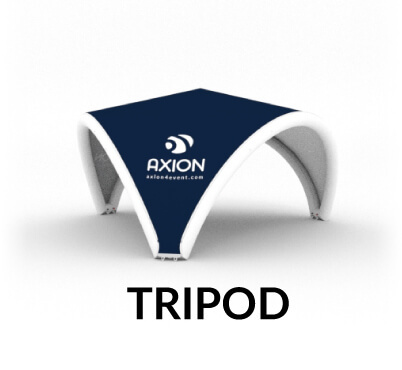 All AXION tents use 250mic seamless TPU bladder tubes using HF welding technologies. All bladders are accommodated in strong 500D HT polyester, so the whole inflatable structure is rigid, yet flexible in a wide range of temperatures from northern winters to hot, humid climates. As we completely manufacture and print our products in our own production facility, it is easy for us to print each tent upon demand. For our inflatable tents we use the newest technology in dye sublimation printing, as well as automatic cutting and welding. Along with the electric pumps, you can inflate your AXION tent using the accu pump or a hand pump within 10 minutes. Even if you only have a standard electric pump, just inflate it next to the electrical outlet and then move inflated item anywhere. Quick, easy, convenient. 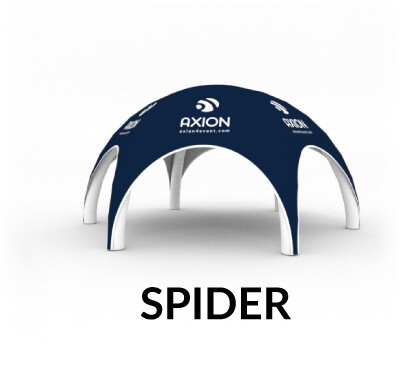 Compared to metal structured tents, there are no dangerous rigid components with AXION inflatables. Compared to the old fashioned inflatable tents with a permanent blower, sealed inflatable tents (also so called pneumatic tents) are independent of a power grid. They do not require continuous inflation. 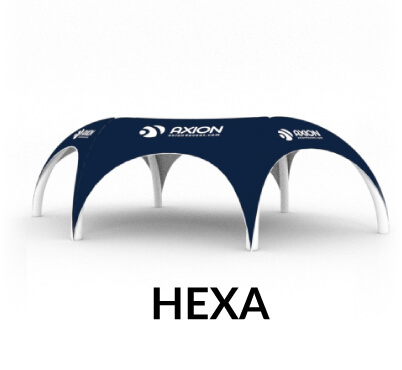 AXION is one of the safest pneumatic tents on the market. Tested for up to 100km/h (62 mph) and certified for 60km/h (37 mph), our inflatable tents can withstand the most extreme weather conditions. 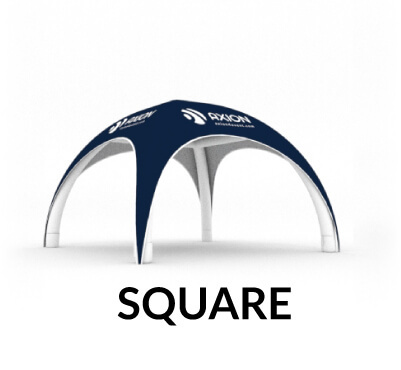 The structures are very flexible and will keep those in the tent safe during strong winds. AXION is designed to bend and twist with the wind and then back to its original shape. 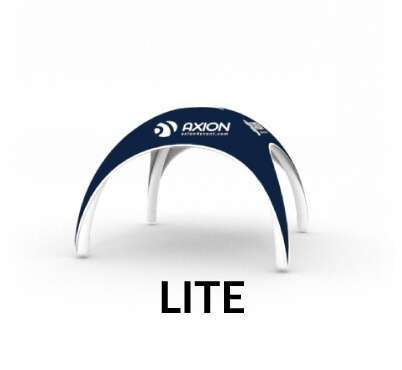 As the leader in the inflatable event tent industry, AXION offers the widest range of shapes and sizes. We have 7 models in a total of 22 sizes. Just choose one of them to enhance your event branding needs. Patented one way central inflation system provides a luxury of one point inflation with perfect control of inflation from chamber to chamber. It also provides easy detection of eventual air leak. Smart inflation system is now included in most of AXION models. Stay within your budget and get more than one roof for the inflatable structure. The simple zip-off system will allow you to change your roof anytime! Be it for different design needs – if you need to re-brand or use the same inflatable structure for more than one brand campaign. 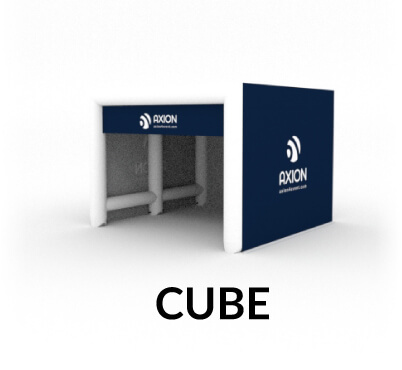 All sizes of each AXION model can be connected together by a tunnel, so a tent village can be created. More over, some sizes of different AXION models can be interconnected using tunnels too. Build an even bigger event with easy to use AXION inflatables. At Axion, we like to believe we think of everything. When faced with that never ending dilemma – ‘should the artwork face inside or outside the tent?’ That’s no problem with AXION – all walls are reversible. You can also get double walls with an opaque layer inside, panorama walls, section walls and more. Original aluminium casted components are used for the bottom part of most of the AXION models, ensuring this structure is reliable, practical and unique in it’s individual componentary. These unique attributes are used for anchoring the tents to the ground and tensioning the roof. It happens – that’s life. You can expect some damage or general wear-and-tear – usually as the moment critique! If ever you find yourself in this situation, simply reach for the repair kit which is available for all AXION models. Thanks to the zip-off roof and the central tube connector, any user can change the inflatable tube onsite within a few minutes without having to send the tent out for service! 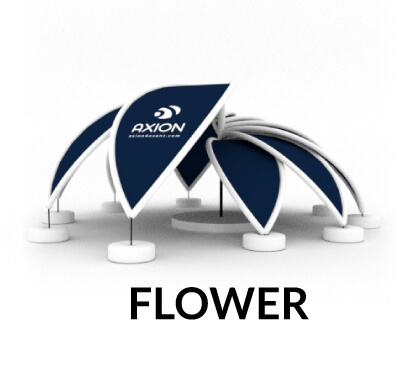 Packed in an original trolley bag, each AXION tent (except the AXION FLOWER) can be easily transported in a standard size sedan vehicle. This is one of the great advantages of our inflatable tents, compared to metal tents, especially when you consider the useful area that the AXION inflatable tents provides.